This week I have been watching my Theatre Arts students give a variety of presentations on theatre traditions originating from their own cultures. Teaching in an international school means that these are always wonderfully varied. What struck me this time however, were the number of students who had identified puppet theatre forms. 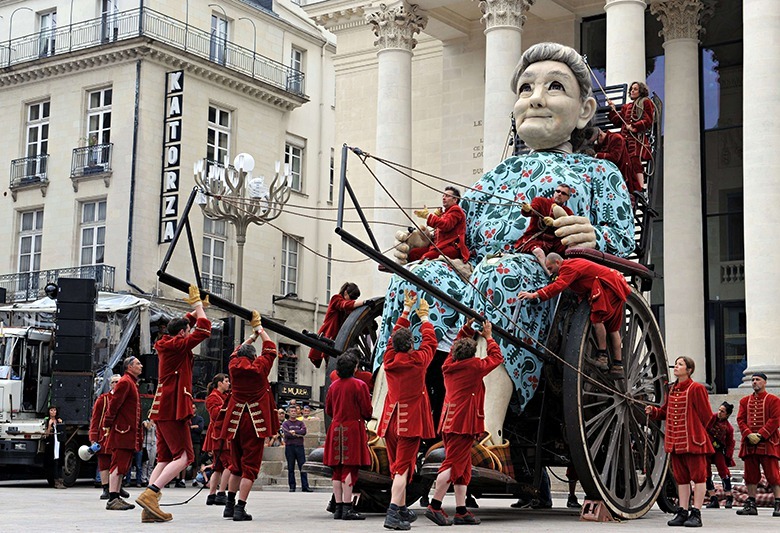 This got me thinking again about the resurgence of puppetry. I then read this article, by Beccy Smith, in Exeunt. In it she ponders the attraction to a modern audience. Smith, as well as being a dramaturg and writer, runs a company called Touched Theatre who are performing a piece called Blue at the Suspense Festival in London. What is it about puppets that so captures the contemporary imagination? 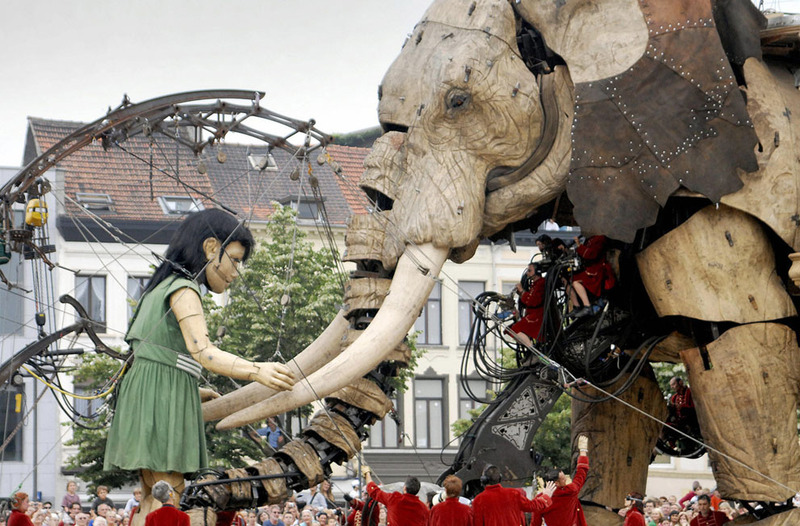 In recent years life-size horses have stormed the West End, a decidedly larger-than-life elephant has paraded down the Mall and beautifully crafted figures of myriad shapes and sizes have entertained audiences in touring theatres up and down the country. Of course, as an art-form puppetry is not new: forms like Greek Karagoz and Indonesian Wayang Kulik can be traced back to ancient times and even our ‘own’ Mr Punch boasts a fairly impressive lineage from as far back as the writing of Pepys diaries and probably beyond. But a growing interest in puppetry has made itself felt of late and there’s a distinct sense that this oldest of theatrical languages is returning en vogue…..What puppetry draws together in these disparate strands is an emphasis on visual storytelling, on expressing meaning through action and image that I think speaks particularly vividly to contemporary audiences versed in media imagery and embodied theatrical languages. I started to get especially interested in the connections between puppetry and other performance languages when making a show called Headcase, in 2011 which was collaboration between a dancer and a puppeteer. The show set out to portray the emotional experiences of teenagers experiencing mental heath difficulties which were themselves difficult to articulate by their sufferers but which we found, by working with the young people over a period of time, could be effectively expressed through movement and gesture. We discovered that dancers have an intuitive understanding of puppetry because of the formal qualities they share in portraying feeling and idea through movement and rhythm (we also learned a lot about the age-old connections of puppetry and therapy, but that’s another article). 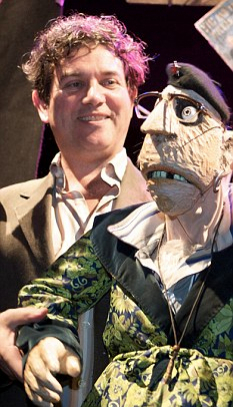 Puppetry has the exceptional ability to combine within itself the abstract with the specific. Puppet figures, embodied as bug-eyed capering monsters or delicately floating wraiths, present character with engaging immediacy. Puppets can talk – sometimes you can’t shut them up – they can do text from Shakespeare to Beckett though they are decidedly not literate because so much of the meaning they convey is expressed through their material form – how they look, how they move, what they are made of. For puppets subtext is in the body. The pretensions of a hero are punctured by his being made out of sponge; a romantic heroine’s mortality is embedded in the fragile paper of which she’s formed. Puppetry is able to borrow the most powerful elements of a range of art forms – the rich metaphors of of the visual arts, the dynamic expressiveness of dance, the detailed articulacy of poetry. They’re a wonderful theatre mongrel for a post post modern audience versed in Brecht and Lecoq. And what is most powerful of course is puppetry’s status as shared fantasy. The wiling suspension of disbelief is in-built to this form and central to its magic, its emotional resonance. In making Blue, the new interactive mystery we ail be opening at SUSPENSE, we wanted to test out how close to the audience we could bring our puppets and still invite them to take an imaginative leap. 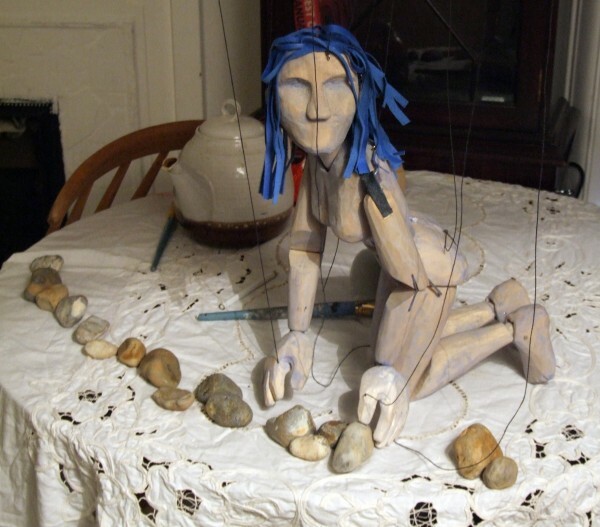 Blue explores working with audiences moving though different spaces on the hunt to discover what has happened to a missing young woman …… and this amplifies the storytelling power of the placement and disclosure of puppets and objects. Whilst our array of suspects characters speak much but reveal little, the memory, metaphor and magic that power the story’s real action express themselves through the puppetry and video that haunt their spaces. You might argue that the appeal of puppetry to today’s audiences is as a way to step out of some of the grimmer realities of our current realities, to reach for the fantasy and playfulness of childhood, but my feeling is that the artistic riches of the art form empower it as a vehicle through which to plumb the depths and articulate the heights of human experience – a range that’s much in evidence in the lovingly crafted programme at this year’s SUSPENSE. It is a worth while listen, as he talks about Bunraku as a puppetry form and why there is a trend for creating puppet theatre for adults. You are left in no doubt that puppetry is a thriving world theatre form that is increasingly being embraced by theatre critics and audiences alike. Long may this continue. In the interview, reference is made to the Suspense Festival, which Glanville started a few years ago, which focuses on puppetry that is specifically made for adult audiences. This year’s festival is about to open, featuring work from companies from a number of countries, much of which has toured internationally. Check who is performing here and just what a diverse range of puppetry style are being showcased. Since I began Theatre Room, I have been following the work of a puppet company called Little Angel Theatre (LAT). It was established in 1961 and one of only three building-based puppet theatres in the UK and is often referred to as the home of British puppetry. Their history is fascinating, with one of the original founders, puppet designer and maker Lyndie Wright, still working with the company 50 years on. In 2011 they collaborated with the Royal Shakespeare Company on a production of the Tempest to much critical acclaim. Their latest production is very much an adult orientated production of Macbeth which has had the twitter-sphere in raptures. Marionette puppet theatre is common across much of Europe, particularly in the more eastern states, so it is great to see this tradition thriving and developing in the UK. LAT runs its own blog which is really interesting and you can read it here. Yesterday, there was an entry about costuming Macbeth, written by the costume designer for the show, Keith Frederick, which I found particularly interesting. For quite some time now, puppet theatre has focused on direct contact puppetry, where the puppeteer is in full view of the audience and their performance completely exposed. With this in mind, and from a personal point of view, the shows that work for me the most are those where the puppeteers are not just in blacks but in costume. Costumes that are well considered for the piece that have the ability, not only to add to a story and set a tone, but also have the to blend in and disappear, having a chameleon effect. Shows like War Horse…….. are excellent exponents of this effect. So, when I was asked to design and make the costumes for the puppeteers in LAT”s newest adult production of Shakespeare’s Scottish play (yes, I am stupidly superstitious) I accepted the mantle of making their mantles! To look similar but distinguishable from each other. For this production of the Scottish play the puppeteers are characters in their own right, the three witches, and the perfect starting point for the design process in making their costumes. Lyndie Wright, who has designed and made the puppets, referenced some shapes for me to work with and in a very short space of time talking together we had decided on a silhouette. With the brief and silhouette in mind I went away and sketched up several options that would fit in with the set and the puppets, using design elements from each. Although working with a contemporary silhouette I have used style lines and treatments with an Elizabethan feel that harken back to the period. Using hem, sleeve, collar and seam detail variations I have tried to make each costume look different yet gel as a collective. As the puppeteers are all dressed in same silhouette and colour I hope the differences are distinguishable enough to stand out yet still subtle enough to disappear. Once the designs and fabrics were chosen and approved the next step was to translate them into patterns. I have drafted three blocks (basic patterns) one for each puppeteer, each a different size, and made jersey and calico toiles (mock ups) in the chosen designs. The next stage in the process is to get the fit right and apply the style lines. This is the most crucial part of the process, the most time-consuming, and can mean several toiles (mock ups) to get it right. Once this is done the patterns can be cut in the fabrics chosen and made up. After a final fitting linings, hems and final details can be finished to complete the garment. From start to finish making the garments should take me about two weeks… however! Last night was press night and I very much look forward to reading the reviews.